We have visited this casino twice. The first time was on a Wednesday to get their Player’s Card. We were given an extra $10 of free play with the card. It’s a Wednesday Special I believe. On Friday we returned for the seafood buffet. I love seafood and have eaten at many of these buffets at casinos. How does this one rate on a scale of 1 to 10? It rates as a 10! Considering that this casino has only been opened for one year, it has quite a following. The line was the longest we had seen for the buffet. We stood in line for over an hour then stood in line again once inside the restaurant for the food line. They had king crab, snow crab, calamari, frog legs, mussels, clams, oysters, cod, salmon, shrimp and all the regular food too. It was fabulous. Price for the buffet was $17.95 but with your Player’s Card you get a $2.00 discount. 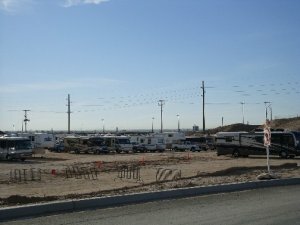 Even though the RV overnight parking area was packed, it is huge and could accommodate even more RVs. We were told parking is limited to three nights. However, one fella indicated he would be there four nights because he didn’t believe they checked. Upon arrival you need to check in at the casino. It’s a great location just off the I-8 freeway west of Yuma.